SWBAT work through the steps of the Engineering Design Process to build the tallest structure from straws that can hold a cup of water for a minimum of 30 seconds. Students act just as real scientists to research, plan, build, test, and rebuild the tallest structure, made of nothing but straws and tape, that can hold a cup of water for 30 seconds. The engineering design process is a process used by scientists in the real world. This process encourages scientific thinking and promotes team work. This lesson is directly linked to standard 3-5-ETS1-1: Define a simple design problem reflecting a need or want that includes specific criteria for success and constraints on materials, time, or cost. I provide information regarding the project objective which includes limitations that the group must consider while designing and building. While researching and planning, students will see a variety of designs and group members may have different ideas that need to be considered. By working through this process, the activity also covers standard 3-5-ETS1-2: Generate and compare multiple possible solutions to a problem based on how well each is likely to meet the criteria and constraints of the problem. Reading standards are connected to this lesson as well through the research process. Standard RI.5.7: Draw on information from multiple print or digital sources, demonstrating the ability to locate an answer to a question quickly or to solve a problem efficiently, is covered through this activity. Students will be finding models created by other people and considering those models when designing theirs. They will use the internet for this research and will view a variety of sources during the process. Math is also connected through measurements made requiring them to apply math practice MP.5: use appropriate tools strategically and MP.6: being precise. This lesson takes approximately 2 hours to complete. I do my engineering projects on our school's half day professional development days because I have 2 hours of instructional time with the students. If you choose to do this activity on a normal school day, it will probably take two days. Day one would be the planning and design day. Day two would be the building and testing day. The goal of today's lesson is to promote scientific thinking through the use of the engineering design process. Students will demonstrate their understanding of the process by completing each step of the process: research, plan, build, and test, to create a structure capable of holding the most weight. Print out a copy of the Engineering Project Planning Sheet for each group. This is a new resource that is introduced in the warm up discussion for groups to use with this project. I begin today's lesson by reflecting on the previous engineering project we completed. I ask students what prevented them from finishing in time, because I had several groups not complete a project. I also ask them to think about what areas they would need to spend more time on, and what areas they would need to work faster through. As they discuss these questions in their group, I circulate to listen to conversations. For the first question, students mention that some group members weren't helping, they did not plan well and were trying to plan as they built, and that they ran out of supplies prior to finishing. I address each of these by reminding students of the importance of being an active participant. I let students know that if I see anyone not helping, they will work alone on the next project. I ask them what made it difficult about planning as they built, and students say they were trying different things and changing it a lot which used up materials. I asked if planning better might help them complete the project with materials given. Some students believed it would, some thought they still weren't provided enough materials. For the second question the majority of students said they need to spend more time building and less time planning. I asked the groups that completed a project if they had a good plan before they started, every group said yes. Each group spent the same amount of time planning, 30 minutes so I explain that in that 30 minutes, the groups that had a well developed plan and stuck to that plan, are the ones who finished successfully. I provide each group with a Engineering Project Planning Sheet. I tell groups that I would like them to try this new planning sheet with this engineering activity and see if it helps. The planning sheet helps students organize their thoughts, identify the role for each group member before beginning, and has them outline what research they found to help them. To select groups for the project today, I placed all student names on craft sticks. I begin the process by pulling one stick out, and then that student comes up and pulls a stick, then that person comes up and pulls a stick, and then that person pulls a fourth and final stick. Those four students form one group. I begin the process again to select the second group, and so on, until there are five groups selected. I choose the groups so that not all of the high students are in the same group. By doing a random draw of craft sticks, it is very unlikely a whole group would be made up of all high performing students. After choosing their groups, I provide each group with a copy of the Engineering Design Project 2 - Straw Structure Task Sheet. I review the objective, materials, limitations, and things that are allowed with them. 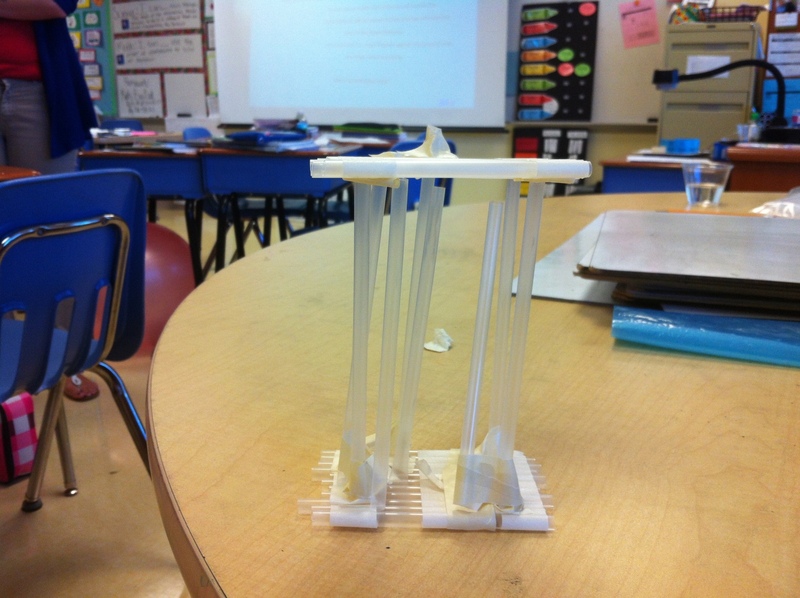 One thing on the task sheet is that students are allowed to test their structure with items other than water. I do not allow them to test with water because the cups could end up spilling and making big messes in the classroom. The only time water can be used is when I am supervising the testing at the end. I do show each group the cup that we will be using and inform them that when their structures are almost complete, I will pass out the cups to them and they can use anything else in the room to test. I show them that 50mL of water will fill the cups about half full of water so think about what the weight of that may be like and try to select items that would weigh about the same. Students begin the design process by getting a laptop and researching possible ways to build their structure. They must complete the engineering project planning sheet and get approval from me prior to building. The research and planning takes groups approximately 30 minutes. I do not lead them through this process as I want them to familiarize themselves with how to conduct research and what sites are useful and not useful. Some groups are choosing to watch Youtube videos, others just did a Google search for straw structures. Once I have approved their plan sheet, they get their materials and begin building. They spend the remaining 60 minutes of time building, testing, making changes, and trying to perfect their design. In the first video of students building, two girls are building their structure. They do have a third group member but that member was out of the room for speech at the time of the building. I chose this video because it demonstrates how effective their planning was. They knew that they wanted to trim the end of the straws so they would fit inside of the adjoining straw prior to taping it. They felt that having the straws tucked into each other would add support. One student's role was to trim the end of the straws and the other student's role was to cut the tape to use when attaching. 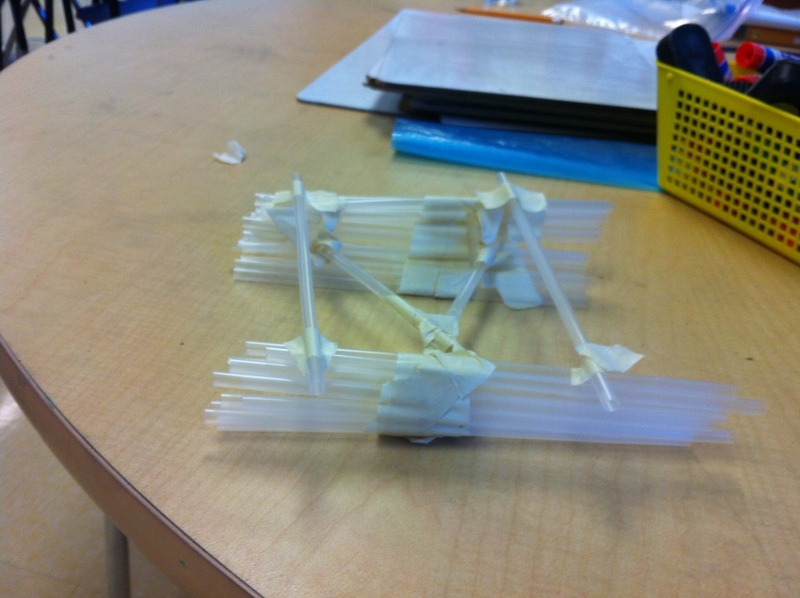 They both worked together to stabilize the structure. I chose video 2 of students building because the group in this video took a different approach that did not seem to be working as well. This group also assigned the role of cutting the tape to one student. This student cut all of their tape into small pieces right when they started and then was finished with his assigned role. He still helped with the building but you can see that with three people all trying to tape the straws together nothing was really getting accomplished. The boys also realized that it probably would have been easier to tape the straws together if they had slightly longer pieces of tape but it had all already been cut. You could see from the video of the first group, they were cutting as they went which gave them more options. 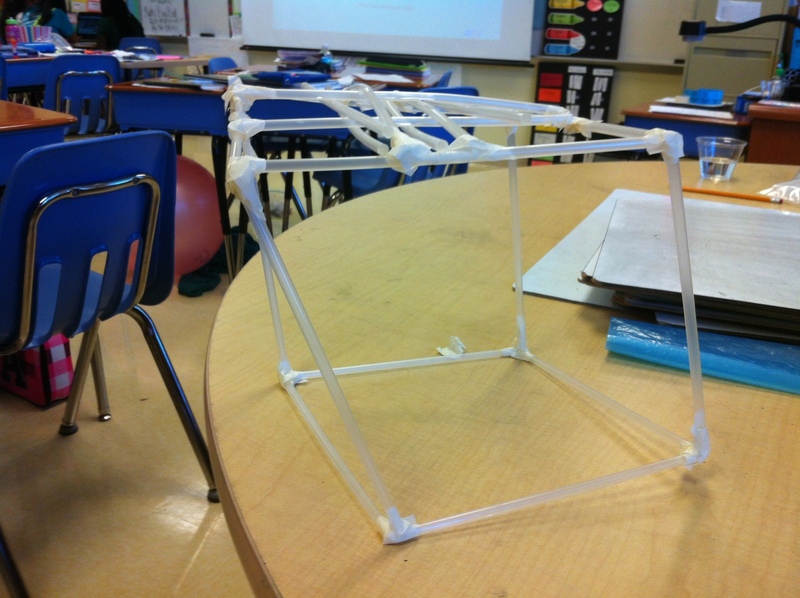 As students are building, I am circulating to ask questions about the design and to help keep them on target to finish. I see some group members not helping so I have them go over their plan with me and explain what their role is and what they should be doing to help their group finish on time. I also provide each group with a cup identical to the one that will be used for testing and inform them that they can use other times to test their structure when it is complete, but they cannot use water. As students begin finishing their projects, I start seeing the cups go on top filled with markers, pencils, anything they can find around the room to add weight to the structure. After 90 minutes of building, I ask students to clean up and return to their seats. I call one group up at a time to test their design. I measure the design first and record the height just in case it collapses or gets ruined while supporting the cup of water. I place the cup of water on the top of the structure and all students do a 30 second countdown to see if the structure can hold it that long. We reflected on the new planning sheet that was used as well. All groups in the second class said it helped. A couple of the groups in the first class said it helped, while others said it didn't because they still changed a lot from their original plan. I pointed out that one area I noticed was not used effectively was the research area. Most groups are simply looking up pictures and not spending time reading research about what makes strong structures. Or considering why groups chose designs they did when they are comparing pictures of previously built structures. I told them this would be an area we try to focus more on in future engineering projects. To connect this activity to real world engineering projects involving building strong structures, you can go through some interviews with real engineers at PBS.org. This site includes interviews with 10 engineers that work on keeping buildings and bridges strong. You can assign one interview per group and have students teach the class about their engineer, or you can just choose one to share with the class.